Clean your house For a Fresh Start. The cleaning ritual, known as Da Sao Chu is done. According to Chinese tradition bad luck, or “huigi “tends to build up in the corners. As New Year is all about, health, wealth and abundance .Three days before the big celebration families undertake a total home cleaning in hopes of sweeping out bad luck and welcoming the future. Many believe that tidying up and tossing out old trash before the New Year will rid them of any negativity still lingering in their life from the previous year. All brooms, brushes, dusters, dust pans and other cleaning equipment are put away. Sweeping or dusting should not be done on New Year's Day for fear that good fortune will be swept away. 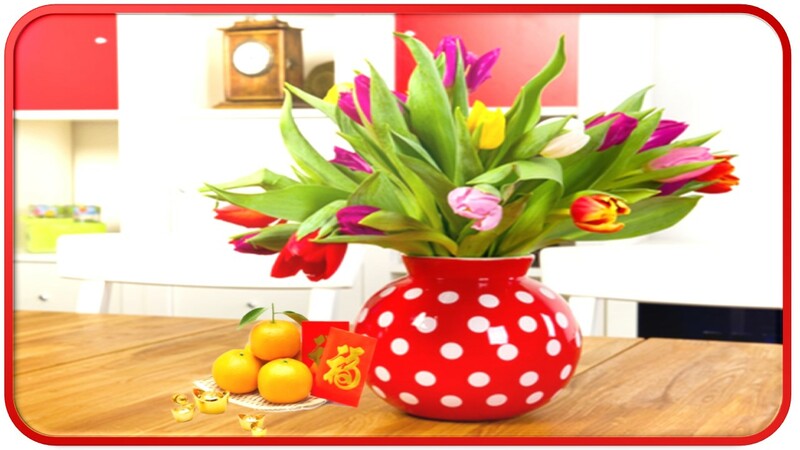 Plants and flowers are also considered lucky, plants and flowers will bring good luck to the families. Among all the plants, the money tree trees are considered as the luckiest while among the flowers, peach blossom is considered to bring good luck and fortune. Fruits are also considered lucky and Tangerine is considered the luckiest for its bright color. Bright Hall in Feng Shui is called a “Ming Tang” in Chinese. We want to see open space in front of every home. This applies to main doors also. This is an essential factor for good Feng Shui. The idea is to capture “Chi” and make it available to the occupants of a home. ”Chi” is harnessed in open spaces so we like to see a very clean Bright Hall on both sides of a door. Start removing any overgrowth of plants that may block the main door. Clear out clutter around your doors. No garbage cans, recycling or composting bins. Don’t let this be your dumping ground for newspapers, magazines, or any other items. Put in bright lights. During the holidays have cheerful decorations. If your mouth of Chi ( Front Door) face South West, the # 5 yellow star brings illness and misfortune to the family. Use metal ornament for the door but keep away the red . And if door faces Northeast the # 2 illness star joins the# 8 money Star which brings fame and wealth. Its element is earth. The two earths are the same element. If the main entrance is in this section, it is not advisable to make any kind of risky investment or career switch. A bit of metal can help. If 2018 brought you nothing but problems, suffering, tears, etc., grab a broom and get to sweeping. On New Year’s Eve, take a broom to the front door and start sweeping out towards the street. This ritual should rid you of all the negativity you’ve harbored throughout the year. Candles may set a new light for a new and better year. Lighting candles on New Year’s Eve can help make a successful and positive year. Lighting a green candle will bring you prosperity, while a yellow candle will help your success. Blue candles will bring health and peace. And if you’re looking for love a pink candle will do great. Sandalwood Incense have always been important and considered to be the most popular way to get rid of negative energies in a house and bring new positive vibes. Many believe having all the house lights on at midnight will bring them clarity and good health in the New Year. The trick here is to turn out most of the lights soon after the clock strikes twelve. Burn the Old-Year in 3 red (Hongbao ) Envelopes. Chinese people love red, and regard red as the symbol of energy, happiness and good luck. Sending red packets is a channel for sending good wishes and luck. A few minutes before midnight, take some time to write everything you’d like to forget from the previous 12 months. Take 3 pieces of white paper (no lines) and with a pencil (no pen) write down in each paper the 3 mayor problems you want to forget. Put the paper inside a red envelope. Next light your envelopes (preferably in a fireproof container) and watch your past troubles burn. Once you’ve left the past in ashes, you’ll be ready to take on the New Year. Tradition dictates problems be burned in the New Year to symbolically purify the maker and help rid them of any residual negative energy still lingering from the previous year. Wishes and resolution are always made throughout the year. They must be placed in a red envelope and burnt. Please follow these steps to empowering the resolutions. 1) Take pieces of white paper, no lines on paper, a pencil and 12 red envelopes. 2) Think very carefully about each one of your wishes. Be clear in your mind what you are wishing for. 3) Write down each resolution. 4) Put each resolution into a red envelope. it permanent and means you will complete the action.